The Bulls have now drifted on down to the bottom of the International League South Division. Standings. This was not a pretty game. This is not a pretty road trip. Visiting Tampa Bay rehabber Drew Smyly get off to a poor start and it went downhill from there. Apparently the idea was to simply let Scott Diamond, who had been the scheduled starter, come in after Smyly got his pitches in. Not a bad idea, assuming that Smyly was ready to go. Smyly came up through the Detroit system and this was his first time in a Bulls uniform. After giving up 4 runs on 51 pitches in 2⅓ innings. José Dominguez finished out the 3rd and then Diamond came in for his “start”. He actually settled down after the 4th inning — and 6 runs — to finish out the game. That spared the bullpen for duty another day, or was perhaps simply an example of being left to twist in the breeze. Note that former Bulls reliever Andy Oliver came on for the Tides in the 9th. He walked two batters but got out of the inning just fine. The 2015 Durham Bulls team simply isn’t very good. Not quite as poor as 2012, but, as the chart shows, they are working their way down into that region. 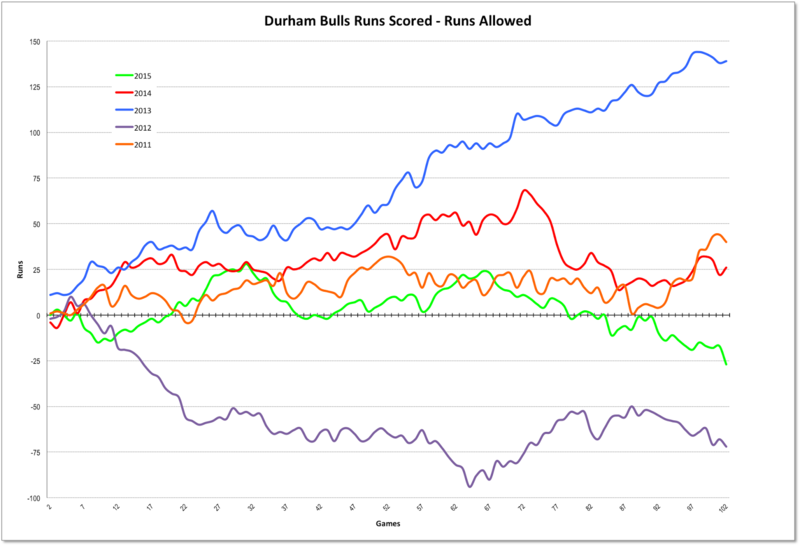 This computation of net runs scored actually tracks out to an even worse Pythagorean Expectation of a won-loss record of 48-54, so the Bulls are doing a good bit better than “expected” under that bit of math. For a while, back around early to mid-June, it seemed as if things were getting on track. But it looks are looking grim just now. Can it get better? Sure. But not without some real improvement in the pitching crew (and a few more runs per game wouldn’t hurt). By this same metric, runs scored minus runs allowed, the 2015 Tampa Bay Rays just reached a five year low. That goes some way to helping explain why the Bulls are the team they are. But not all the way. We’ll save for another day a look at the platoon of pretty good baseball players the Rays dropped off the Bulls roster after a spate of panic buying this spring. The Bulls are off to Lawrenceville, Georgia for a three game set before coming back to Durham. The Braves have been on a run lately and are a ½ game ahead of the Bulls in the standings. 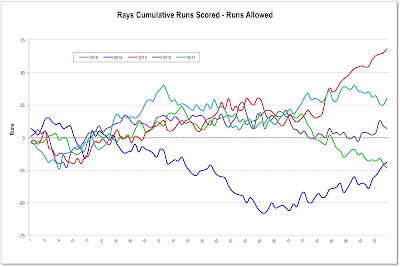 Actually, what the Rays chart isn't exactly a 5-year low. 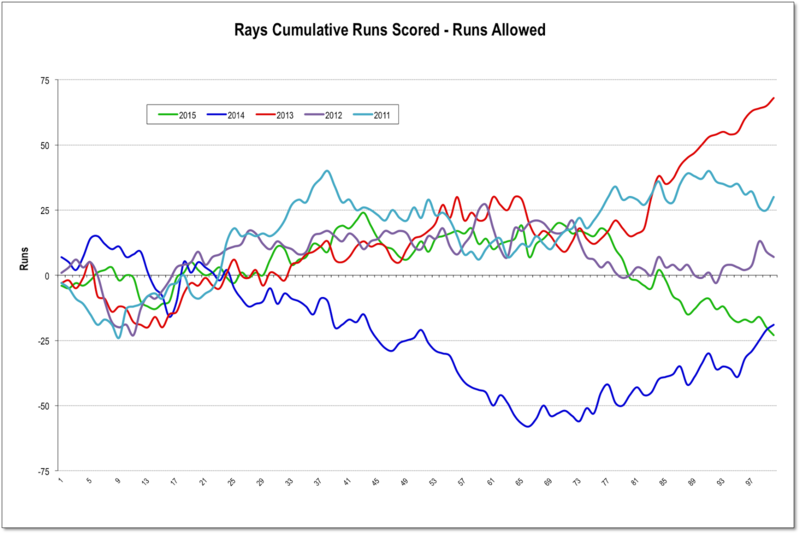 It shows the Rays performance dropping below that of the 2014 Rays, the worst team in 5 years down there in St. Petersburg. "what the Rays chart shows ...."